Hey by now most of you must have received your new and improved tmw card, which is issued with Federal Bank and powered by MasterCard.. Now excited to use it to manage your spends in a smarter way? it just takes less than 30 seconds to activate your card before you swipe it. Just follow the following easy steps and you are ready to start using it. · Now open tmw app on your smartphone & go to cards section at the bottom of the dashboard screen. · Click on Physical Card & Block your existing RBL card by following the instructions. · Now click on activate. 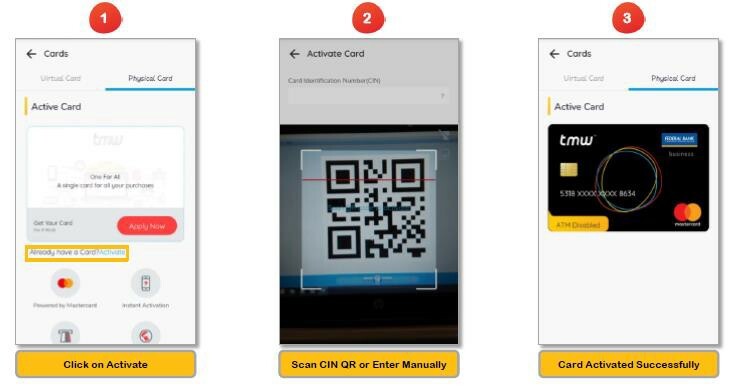 To activate the card, Scan the QR Code present on the welcome letter of your card or Enter the CIN Number manually printed below QR Code. And you are done. Your card is activated successfully & linked to your tmw account. Isn’t it Super-Fast and Quick! Change PIN :To set up your Transaction and ATM Pin, tap on card and click on Change PIN. Verify your MPIN. Now set your New PIN and re-enter to confirm it. Pause Card : Pause Card feature is one of its kind where it allows you to pause or stop your transactions temporarily. 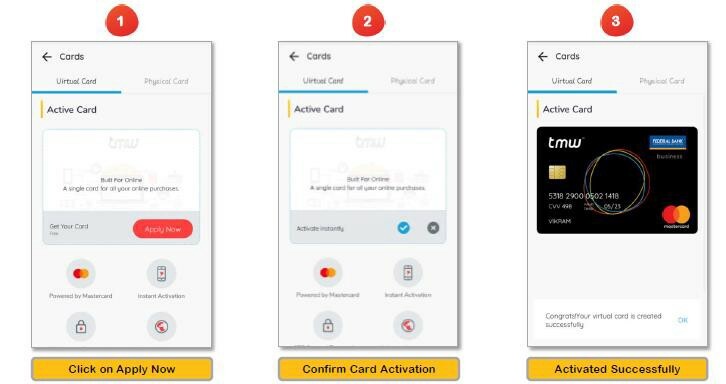 You can anytime pause or un-pause your card using this feature. ATM :If you are a KYC Customer, you can also manage ATM Withdrawal service from the App by toggling ATM Button. Block Card : In case if you have lost your tmw card. Don’t worry. You can block your call directly from the app in single. Just click on Block and Confirm. It’s done. For more details on exciting offers, deals and discounts please visit offers section on your tmw app.